“Breezing” generally indicates the horse was not under strong urging, while “handily” typically denotes the horse was under urging from its rider (this can vary by location). Numbers in parentheses represent the ranking among other horses who worked that day at that distance and at that track. Anothertwistafate: 4/4 – The Grade 3 Sunland Derby runner-up, who is likely to try to add to his 30 qualifying points for the Grade 1 Kentucky Derby by racing in Keeneland’s Grade 3 Lexington Stakes on April 13, breezed four furlongs on Sunland Park’s fast course in 46.80 (1/7). 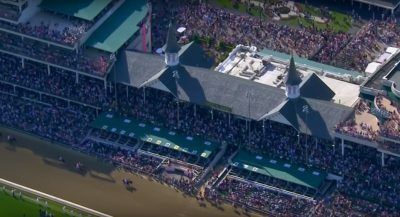 By My Standards: 4/4 – The Grade 2 Louisiana Derby champ became the first horse to work at Churchill Downs for the 2019 Kentucky Derby when he beezed four furlongs in 48:40 (7/28) over that fast main track. Galilean: 4/7 – The California-bred son of Uncle Mo, who was third last out in a division of Oaklawn Park’s Grade 2 Rebel Stakes, worked six furlongs handily on a fast Los Alamitos oval in 1:14.60 (3/3) for a planned start in the Grade 1 Arkansas Derby. Gray Attempt: 4/5 – The multiple stakes victor recorded a five-furlong breeze in 58.60 (1/8) over fast dirt at Oaklawn Park ahead of an expected run in the April 13 Arkansas Derby. Spinoff: 4/3 – Todd Pletcher’s trainee began preparations for the Kentucky Derby with a four-furlong breeze on a fast surface at Palm Beach Downs in 48.85 (1/6). War of Will: 4/6 – In his first official exercise since suffering an injury in the Louisiana Derby two weeks earlier, owner Gary Barber’s multiple graded stakes winner breezed four furlongs in 48.80 (34/109) over Keeneland’s fast track. Churchill Downs on the first Saturday in May. Admire: 3/30 – The Dale Romans trainee prepared for an expected run in Keeneland’s Grade 2 Blue Grass Stakes by breezing five furlongs in 1:01.13 (13/59) on Gulfstream Park’s fast main track. Dream Maker: 3/30 – Conditioner Mark Casse’s Tapit colt Keeneland breezed four furlongs from the gate over Keeneland’s fast course in a scorching :46.00 (1/48) ahead of a planned start in the April 6 Blue Grass Stakes. Durkin’s Call: 3/27 – The Gander Stakes winner, who may make his graded stakes debut in Aqueduct’s Grade 2 Wood Memorial on April 6, breezed four furlongs in :49.05 (3/29) on Belmont Park’s fast training track. Jersey Agenda: 4/1 – The Charles Fipke homebred fired the five furlong bullet with 1:00.00 (1/18) breeze over fast dirt at Oaklawn Park. Omaha Beach: 3/29 – Oaklawn Park’s Grade 2 Rebel Stakes division champ worked four furlongs handily on Santa Anita’s fast oval in :47.80 (1/25). Tacitus: 3/31 – Juddmonte Farms’ homebred son of Tapit recorded a four-furlong breeze in 49.80 (11/31) over a fast surface at the Payson Park Training Center. Final Jeopardy: 3/22 – The son of 2007 Kentucky Derby champion Street Sense tuned up for a planned start in Aqueduct’s Grade 2 Woof Memorial with a four-furlong breeze in :52.80 (59/63) on a fast oval at the Palm Meadows Training Center. Garter and Tie: 3/23 – Jacks or Better Farm Inc.’s multiple stakes-winning homebred breezed five furlongs over Gulfstream Park’s fast main track in 1:02.22 (24/40) in his final exercise prior to the March 30 Grade 1 Florida Derby. Long Range Toddy: 3/25 – In his first work since capturing a division of Oaklawn Park’s Grade 2 Rebel Stakes, Steve Asmussen’s trainee breezed four furlongs in :51.00 (14/19) on that fast dirt. More Ice: 3/24 – The El Camino Real Derby show finisher worked six furlongs handily over a fast Santa Anita course in 1:14.80 (9/22). Much Better: 3/25 – Hall of Fame conditioner Bob Baffert’s graded stakes-placed colt earned the five-furlong bullet by breezing in 1:00.45 (1/12) on Belmont Park’s fast training track. Somelikeithotbrown: 3/23 – The Grade 3 Jeff Ruby Steaks victor breezed five furlongs over Turfway Park’s fast all weather surface in 1:00.20 (6/39). Code of Honor: 3/16 – In his first official work since capturing the Grade 2 Fountain of Youth Stakes, Shug McGaughey’s charge breezed five furlongs in 1:01.00 (1/6) on fast dirt at the Payson Park Training Center. Hustle Up: 3/17 – The multiple stakes-winning gelding tuned up for the March 24 Grade 3 Sunland Derby with a six-furlong breeze over Sunland Park’s fast track in 1:11.40 (1/4). Mucho Gusto: 3/18 – Trainer Bob Baffert’s Sunland Derby morning line favorite worked six furlongs handily in 1:13.60 (2/11) on a fast surface at Santa Anita. Roiland: 3/12 – The Grade 2 Risen Star Stakes show finisher continued preparations for his March 23 return in Fair Grounds’ Grade 2 Louisiana Derby by breezing six furlongs over that fast course in 1:15.20 (1/1). Sueno: 3/16 – The Grade 3 Southwest Stakes runner-up worked six furlongs handily in 1:12.40 (2/9) on a fast oval at the San Luis Rey Training Center in advance of a start in the Lousiana Derby. Vekoma: 3/15 – With trainer George Weaver’s wife, Cindy, in the irons, the Grade 3 Nashua Stakes champ breezed four furlongs over Palm Beach Downs’ fast track :49.76 (7/18) ahead of an expected start in Gulfstream Park’s March 30 Grade 1 Florida Derby. Alwaysmining: 3/9 – Runnymede Racing’s multiple stakes-winner fired the four-furlong bullet with a :48.20 (1/33) breeze on a fast all weather track at Maryland’s Fair Hill Training Center. Country House: 3/10 – The Grade 2 Risen Star Stakes runner-up continued preparations for a return to Fair Grounds for the Grade 2 Louisiana Derby on March 23 by breezing five furlongs over fast dirt at Florida’s Payson Park Training Center in 1:02.40 (1/5). Harvey Wallbanger: 3/9 – Trainer Ken McPeek’s Grade 2 Holy Bull Stakes hero breezed four furlongs in :48.35 (4/80) on a fast Gulfstream Park surface. Improbable: 3/10 – The Grade 1 Los Alamitos Cash Call Futurity champ worked five furlongs handily under Drayden Van Dyke over that fast course in :59.20 (6/25) to prepare for his seasonal debut in the Grade 2 Rebel Stakes on March 16 at Oaklawn Park. Nitrous: 3/11 – The Riley Allison Derby winner breezed five furlongs in 1:01.20 (17/28) on a fast oval at Fair Grounds for Hall of Fame conditioner Steve Asmussen. Tax: 3/9 – With regular exercise rider Rolando Quevedo in the irons, the Grade 3 Withers Stakes victor breezed five furlongs over Belmont Park’s fast dirt training track in :59.60 (2/23). Game Winner (photo by Tom Ferry). Anothertwistafate: 3/2 – The El Camino Real Derby winner worked four furlongs handily in :49.40 (14/55) on a fast all weather oval at Golden Gate Fields. Avie’s Flatter: 3/4 – The two-time Woodbine stakes hero and Canada’s likely Sovereign Award Champion 2-year-old Male breezed four furlongs over fast dirt at the Palm Meadows Training Center in :49.25 (11/20) in advance of a planned start in the March 9 Grade 2 Tampa Bay Derby. 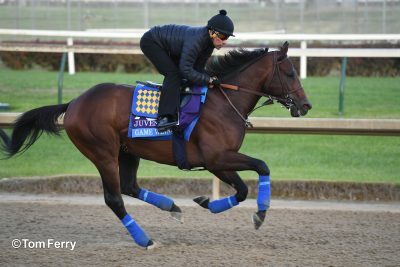 Game Winner: 3/4 – Trainer Bob Baffert’s reigning Champion 2-year-old Male worked five furlongs handily in 1:00.60 (6/42) on Santa Anita’s fast surface to prepare for his seasonal debut in that track’s Grade 2 San Felipe Stakes on March 9. Haikal: 3/1 – Conditioner Kiaran McLaughlin’s Jimmy Winkfield Stakes victor breezed four furlongs over Belmont Park’s fast training track in :48.10 (11/84) ahead of an expected run in Aqueduct’s March 9 Grade 3 Gotham Stakes. Laughling Fox: 3/2 – The Union Rags colt, who rallied from far back to capture an Oaklawn Park allowance optional claiming contest last month, breezed five furlongs in 1:00.80 (5/40) on that fast course and could make his stakes debut there in the Grade 2 Rebel Stakes on March 16. War of Will: 3/2 – Owner Gary Barber’s multiple graded stakes champ began preparations for the March 23 Grade 2 Louisiana Derby at Fair Grounds with a four-furlong breeze over that sealed track labeled good in :50.20 (63/87) under jockey Declan Carroll. Is Unique Bella Better than Songbird? The Numbers May Surprise You!